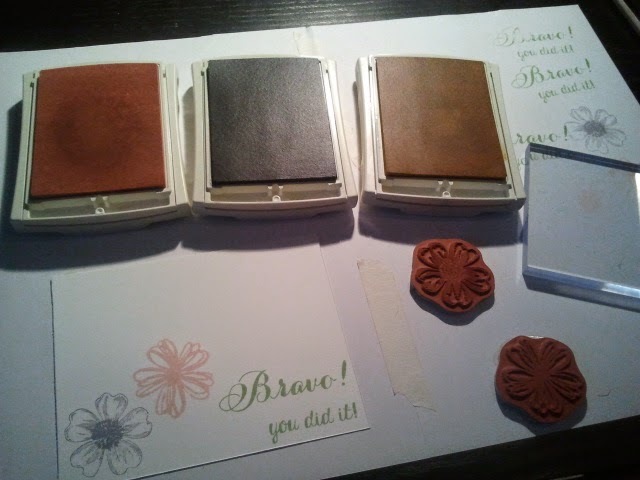 I thought I'd do a photo tutorial showing how easy making a card with Stampin' Up products can be to those who are new to paper crafting or just getting started. These are all my supplies. I cut a piece of Kraft cardstock in half and scored it in half. Then I cut a piece of Whisper White to 10x14.4 cm. The colours I'm using are So Saffron, Wisteria Wonder, Pear Pizzaz and Blushing Bride. The baker's twine is Coastal Cabana and the stampsets are Bravo and Flower Shop. 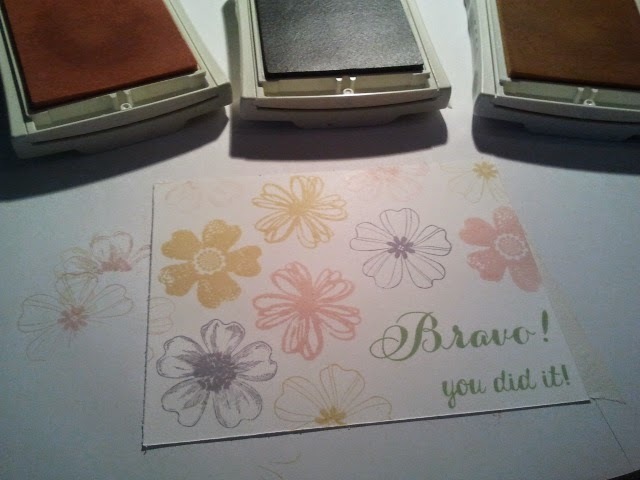 Then I stamped my sentiment from the Bravo stampset in Pear Pizzaz in the right bottom corner. I then started in with the flowers, alternating colours and stamps as I went along. Now all the stamping is done and I trimmed the cardstock down because it was my second card and I had neglected to see if it was cut down to the right dimensions. Then I added the twine (I like looping it around 3 times and then tying a simple bow) and added a rhinestone to one of my flowers for a little bling. I glued it to my cardbase and voila, all done. I think I was busy for maybe 2 minutes (not counting all the time I took to take pictures) This is such a nice and simple card yet there's still a WOW element, I think.